An impressive but simple pasta dish that kids will love to help you cook – the uncomplicated flavours will appeal to developing tastes. Preheat the oven to 180C/gas 4. Put the spinach and a drizzle of olive oil in a large pan over a low heat. Add the nutmeg, season with salt and pepper, cover and leave to sweat. Help the kids to stir it occasionally until the spinach has cooked down. Place in a bowl and set to one side to cool a little. In the same pan, heat a drizzle of olive oil and gently sweat the onion until soft. Add the garlic, tomatoes, bay leaf, a few basil leaves and lemon zest and let it gently simmer for 20 minutes until the sauce has thickened. Season with salt and pepper. Have the kids squeeze the moisture out of the spinach into the bowl. Place the spinach on a board so you can chop it up. Return the spinach to the liquid in the bowl and get the kids to stir in the ricotta, beaten egg and parmesan. Season to taste. Sit the piping bag in a jug, fold its edges over the rim, then spoon in the spinach mixture. 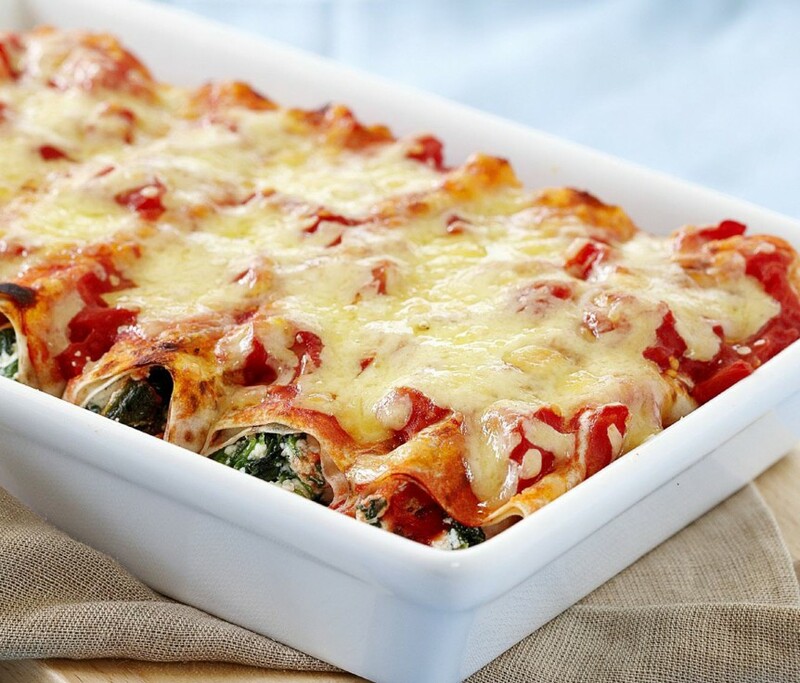 Have the kids help pipe the mixture into the cannelloni tubes and lay them in a 20cm x 25cm oven dish. Spread the tomato sauce over the cannelloni. Scatter over most of the basil, lay the mozzarella slices on top, drizzle with extra-virgin olive oil and season. Place in the oven and cook for 35–40 minutes or till the top is golden and the pasta tender (if the top browns too fast, cover the dish with foil). Remove from the oven and let stand for a few minutes before serving with the remaining basil.